Is there a better alternative to Fish vs Crabs? Is Fish vs Crabs really the best app in Strategy and War category? Will Fish vs Crabs work good on macOS 10.13.4? Fish vs Crabs needs a review. Be the first to review this app and get the discussion started! Fish vs Crabs needs a rating. Be the first to rate this app and get the discussion started! Fish vs. Crabs is an immersive 3D underwater tower-defense game. You play the role of the fish defending your eggs from invading crabs, shrimp, and lobster. The invaders advance along the sandy ocean bottom toward their goal. You must strategically place your towers in an effort to prevent the invaders from reaching your eggs and escaping with them. Your protected eggs are moved to a protected reef that you see as your main game menu. 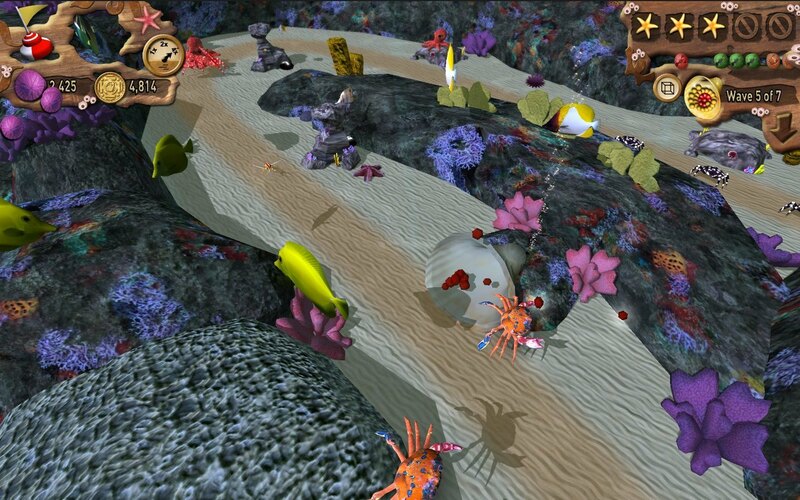 Customize your main menu by placing coral, sponges, rocks, and fish around the reef. Different combinations of items will cause the fish to hatch. Name the fish in your reef or feed them to make them grow. New items will be added to the system at regular intervals for you to discover and decorate your reef system with. We will continuously be refining fish behaviors, improving visuals, and balancing game play to give you the best game experience and enjoyment of your reef in addition to new and challenging tower-defense levels and new objectives. 6 game-play modes, including Slack Tide, The Coming Storm, Davy Jones Locker, Secure the Booty, Into the Deep, Green Seas. 24 levels of play on 3 themed islands, Coconut Island, Turtle Beach, and Pirate Cove. Regular game updates deliver new fish, islands, game play modes, and social features.